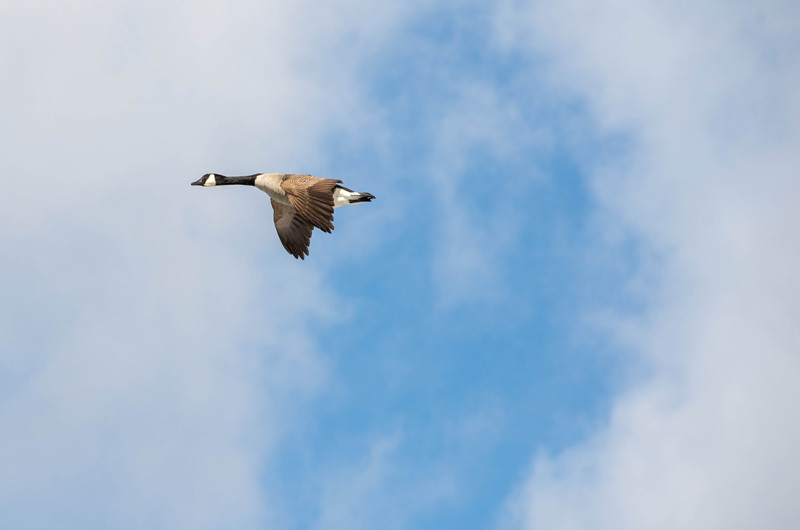 Seven of the two dozen geese grazing on the oasis of open water have scuffled into the air and set sail for greener pastures on some pond or cove away up-Island. Behind a leader whose election has occasioned a continuing ovation, five fall into line. The seventh flies a position to the rear and the right of the line, like this --- for a mile or so. Then suddenly in a gust of shouting to and fro, No . 7 peels off the formation and circles back to the congregation. And that was that, but if you’ve followed that sequence of decision-making thus far we’re both of us in deeper water than may be safe. A cloud of finches has just twittered past my skylight. How did it know that spring is just around the corner? One night last week Ratty, the muskrat who adopted us in January, climbed the bole of a tree, out along a maze of branches, and down a long thin copper wire to gorge himself on pawfuls of suet. A dog lost in Connecticut comes panting home up a lane in Chilmark. A cat errant returns from its gallantries and notifies its family that all is forgiven by tapping at the window. My experience in this line of work is limited; every Vineyarder, having paid attention to the world around him longer than I, knows livelier stories about crows that count by twos, puzzle-solving raccoons and squirrels, terns that destroy their eggs rather than surrender them to marauding skunks; the point is that when I ask what it is that makes creatures do the brilliant things they do. I get the same infuriating answer. Instinct. It’s all instinct, you know (so goes the answer) ­— the creatures’ hereditary, unalterable, involuntary response to external stimuli. Every creature except us in any species of creatures is an exact replica of every other such creature, as much alike as a series of assembly-line computers, undifferentiated, automations to revert to Descartes’ dull metaphor. Do not grieve over the stripped blue bones of this rabbit, because 200 faithful copies of it are skipping at this moment across some distant hill. The species lives. The individual does not matter. It seems to me that talk about instinct is largely flapdoodle, self-denouncing. In The Outermost House the sandpipers scurry along the edge of the wash as if the flock were a single being, and rise as one, circle as one over the surf, and as one settle on the sand and resume their grubbing. Instinct. The birds are responding to certain sensory inputs: the height of the sun, the feel of the wind, the look of an approaching breaker. Each behaves as each other does. Coded into their genes. Naturally. No one knows whether this hypothesis is correct. It’s the one we use. But here are two dozen geese. Each is supplied at birth with the same sense apparatus as the others. They are surrounded by one and the same environment of cold and wind and frozen ice, rippling water, the rotting garbage of weed on the bottom of the pond. Seven decide there’s no future in this racket, and 10 off to seek their fortune in Sengekontacket or the Chilmark meadows. One decides like Hamlet he’d rather bear those ills we have than fly to others that we know not of, and comes back to the bosom of the community. Sandpipers flock. A goose goes it alone. Naturally. Instinct. Yet is it clear enough that the lone goose, the drop out or deserter or prodigal son (all the metaphors are crude), has made choices, and to ascribe its final choice to instinct is to make of instinct a question-begging epithet. I am pretty sure that if they put their minds to it in the name of national security and a $38-billion contract, technologists could design and produce an electronic goose, complete with feathers and black bib and Klaxon honk, that would respond as sensitively as we humans do to such inputs as light and relative heat and declination of the sun. Come November, it would come clamoring in from the Canadian tundra; come March, it would cry farewell and go back. Technology could duplicate a lot of involuntary behavior. On Main street robots would scratch their bottoms, pick their noses, shake their fists at mud-spattering trucks. But a little of the behavior of men and geese is in response to stimuli that can’t be weighed or measured or quantified on a dial, and I suspect that if a Canada goose’s scanning a range of alternatives and selecting one is a mere matter of instinct, the same contemptuous thing can be said of any poem or painting or Taj Mahal or computer. And I propose that when such behavior turns up as is the result of the agony of thought, the response to a stimulus generated within whatever is a mind, we do it the honor of gasping in wonder. We are in danger of forgetting our kinship with everything that lives.